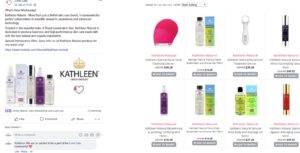 We are super excited to announce that Kathleen Natural is now available to shop on LoveLula. Fitting with our philosophy at Kathleen Natural – Love Lula say “No” to Parabens, “No” to SLS’s and “No” to animal testing and believe that using natural ingredients in their purest form makes a world difference and so, they seek out beauty products like Kathleen Natural range which embrace the spirit of pure, natural and organic living. We’re delighted to be included in such an amazing curation of natural and organic skincare and bodycare. Enjoy 20% off our skincare and bodycare range when you shop on Love Lula. Shop here. Why not join Love Lula’s Natural Beauty Club on Facebook? Uniting over 3,100 lovers of natural and organic skincare, bodycare and haircare, the Love Lula Beauty Club is the place to exchange tips and tricks! Oh, and there’s always an offer popping up for the exclusive beauty club members. ← It is coming home! To celebrate the official launch of our Body Range together, 30% off Everything till Sunday.